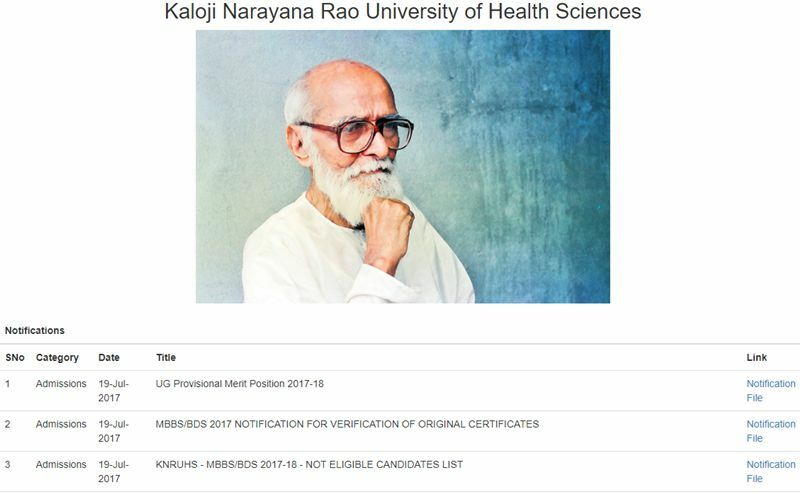 TS NEET MBBS Merit List 2017: The Kaloji Narayana Rao University of Health Sciences, Telangana has released Telangana NEET MBBS / BDS Provisional Merit List 2017. Aspirants seeking for Medical Courses like MBBS/BDS Courses can check the UG merit list pdf at knruhs.in. KNR University of Health Sciences, Warangal, Telangana State hereby notify that the first and final verification of certificates for Web Based Counseling will be conducted for Admissions into MBBS/BDS Courses for the academic year 2017-18 into Medical and Dental Colleges affiliated to KNR University of Health Sciences, Warangal, Telangana State. The candidates those who have qualified in NEET UG 2017 and registered on-line and paid the Registration / Processing Fee in response to notification for Competent Authority quota seats, whose names are displayed in the provisional merit list of KNR UHS are directed to attend the verification of Original Certificates for Web based counseling for admission into MBBS / BDS Courses for the academic year 2017-18 into the Telangana Government, Un-aided Non-Minority, Un-aided Minority Medical Colleges, Government, Un-aided Non-Minority Dental Colleges ( including Statewide college) in the Telangana State at the Help line Centers as per the schedule. I have applied in sports quota but all of sudden I have not attended the counseling on sports quota date counseling.can I attend the normal counseling….